A robot masseuse has started work in Singapore today. Named Emma, short for Expert Manipulative Massage Automation, it specialises in back and knee massages as it mimics the human palm and thumb to replicate therapeutic massages such as shiatsu and physiotherapy. Emma started work on her first patients today at the NovaHealth Traditional Chinese Medicine (TCM) clinic, working alongside her human colleagues – a physician and a massage therapist. Emma 3.0 – the first to go into public service – is a third more compact than the first prototype unveiled last year, offers a wider range of massage programmes and provides a massage that is described by patients as almost indistinguishable from a professional masseuse. Emma uses advanced sensors to measure tendon and muscle stiffness, together with Artificial Intelligence and cloud-based computing to calculate the optimal massage and to track a patient's recovery over a course of treatments. Emma is developed by AiTreat, a technology start-up company incubated at Nanyang Technological University, Singapore (NTU Singapore). Just two years old, AiTreat has a valuation of SGD$10 million (USD $7.3 million) after it recently completed its seed round funding, supported by venture capitalists from Singapore, China and the United States, including Brain Robotics Capital LP from Boston. Founder of AiTreat and NovaHealth, Mr Albert Zhang, an alumnus of NTU Singapore who led the development of Emma, said the company's technology aims to address workforce shortages and quality consistency challenges in the healthcare industry. Using Emma in chronic pain management has the potential of creating low-cost treatment alternatives in countries where healthcare costs are high, and where aging populations have a growing demand for such treatment. Mr Zhang said that Emma was designed to deliver a clinically precise massage according to the prescription of a qualified traditional Chinese medicine physician or physiotherapist, without the fatigue faced by a human therapist. "By using Emma to do the labour intensive massages, we can now offer a longer therapy session for patients while reducing the cost of treatment. The human therapist is then free to focus on other areas such as the neck and limb joints which Emma can't massage at the moment," said Mr Zhang, who graduated from NTU's Double Degree programme in Biomedical Sciences and Chinese Medicine. In Singapore, a conventional treatment package for lower back pain consisting of a consultation, acupuncture and a 20-minute massage, would typically range from SGD$60 to SGD$100 (USD$44 to USD$73). At NovaHealth TCM clinic, a patient could receive the same consultation, acupuncture but with a 40-minute massage from Emma and a human therapist for SGD$68 (USD$50). Emma is housed in a customised room with two massage beds. Located in between both beds, Emma can massage one patient while the physician provides treatments for the second patient, before switching over. This arrangement ensures Emma is always working on a patient, maximising the productivity of the clinic. It is estimated that staffing requirements to run a clinic can be reduced from five people to three, as Emma does the job of two masseuses. 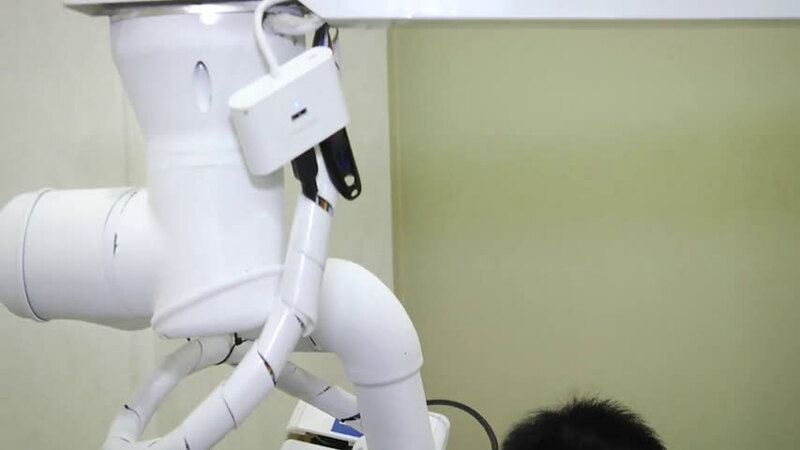 Emma has a touch screen with a fully articulated robotic limb with six degrees of freedom. Mounted at the end of the limb are two soft massage tips made from silicon, which can be warmed for comfort. Emma also has advanced sensors and diagnostic functions which can measure the exact stiffness of a particular muscle or tendon. The data collected of each patient is then sent to a server in a cloud, where an Artificial Intelligence (AI) computes the exact pressure to be delivered during the massage procedure. The AI can also track and analyse the progress of the patient, generating a performance report that will allow a physician to measure a patient's recovery using precise empirical data. This proprietary cloud intelligence is supported by Microsoft, after Mr Zhang and his teammates won the Microsoft Developer Day Start-up Challenge last year. 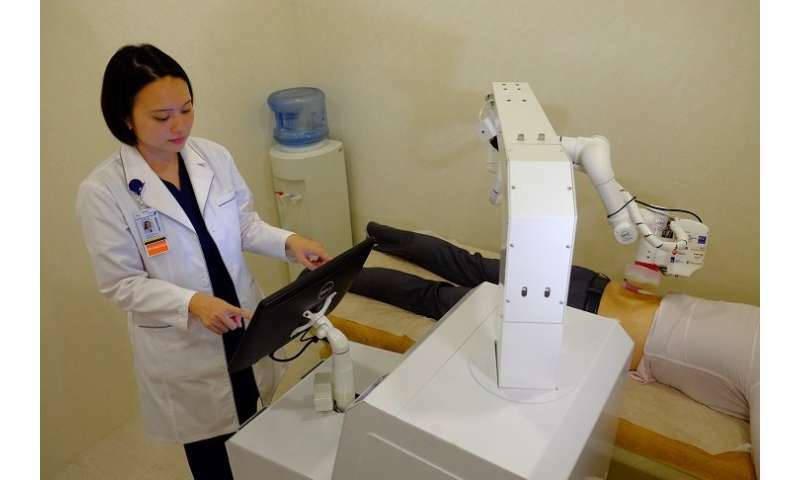 Once it has proved that Emma can improve the productivity and effectiveness of TCM treatments, Mr Zhang hopes it could be a business model for other clinics to follow in future. AiTreat is currently incubated at NTUitive, the university's innovation and commercialisation arm. The start-up is supported by the StartupSG-Tech grant, which funds up to SGD$500,000, as well as SPRING Singapore's ACE start-up grant and the Technology for Enterprise Capability Upgrading (T-Up) grant. The development of Emma is also on the TAG.PASS accelerator programme by SGInnovate, which will see Mr Zhang tie up with overseas teams to target multiple markets such as in US and China. Chief Executive Officer of NTU Innovation and NTUitive Dr Lim Jui said harnessing disruptive technologies such as robotics and AI to improve everyday life is what Singapore needs to keep its innovative edge. "To remain competitive in the global arena, start-ups will need to tap on emerging technologies to create a unique product that can tackle current challenges, similar to what AiTreat has done," Dr Lim explained. "We are proud to have guided Mr Albert Zhang in his vision to bring affordable healthcare solutions to the market for Singapore, which can alleviate some of the chronic pain problems which our elderly faces." The official launch of Emma and the NovaHealth clinic today was attended by fellow entrepreneurs and industry leaders, including Mr Inderjit Singh, Chairman of NTUitive, NTU's innovation and enterprise arm, and a member of NTU Board of Trustees. Mr Inderjit Singh said, "There is great potential for Emma to be of service to society, especially as the population ages. The massage techniques of experienced and renowned TCM physicians can be reproduced in Emma, giving the public easier access to quality treatment. I look forward to future studies which could improve the efficacy of such massages, using herbal ointments containing modern ingredients that improve wear and tear, such as glucosamine. Running in parallel to Emma's work schedule is a research project to measure and benchmark Emma's efficacy, comparing it to those of a human masseur.